I have to wonder when Russian President Vladimir Putin sleeps. He’s busier than any other leader, traveling the globe while consistently changing the board state geopolitically. While everyone, including me, has had their eye on the turmoil in U.S. political circles over the past couple of weeks, Putin visited India and in a little less than two days ended most speculation as to where India stands in the emerging multi-polar world that Putin and Chinese Premier Xi Jinping are building. Putin and Indian Prime Minister Narendra Modi inked deals with huge future consequences for both countries. So, while the headlines were all about the Trump Administration trying to pressure India into not buying S-400 missile defense systems from Russia, Putin and Modi put the final touches on Russia building India no less than six more nuclear power plants. One of the things holding India back as a first-world economy is a reliable electricity grid. Having eight Russian-designed and built plants operating around the country will upgrade the landscape for India’s electricity usage immensely. Part of the reason India is such a large oil and gas importer is their electricity base load needs are being met with expensive hydrocarbons. Shifting that to nuclear,more like France and the U.S., changes everything, especially in the long run, from a foreign exchange perspective. Bernard at Moon of Alabama was first on interpreting what the scope of these deals mean for the U.S.’s attempt to cleave India from the BRICS alliance. He rightly linked the western media’s finally picking up the Rafale fighter jet corruption scandal dogging Modi as a sign that the U.S. is very angry over these deals and is beginning the process of undermining Modi’s government. Modi in every way declared India’s independence from the U.S’s “Quad” strategy aligning Japan, Australia and India with U.S. interests versus that of the BRICS and China’s Belt and Road Initiative (BRI). Remember, last year I told you about the early stage talks between Gazprom and the principle countries to resurrect the Iran-Pakistan-India pipeline, or IPI. A small note in RT last year was all we heard of this until recently. FROM RT: Moscow and Tehran are about to sign a memorandum of understanding to back a new gas pipeline project, according to Russian Energy Minister Aleksandr Novak. So, the IPI pipeline, long sought-after by all players and fought against by the forces of Hillary Clinton and the U.S. geopolitical guiding lights, is finally going to get done. And will likely get done before the TAPI pipeline – Turkmenistan Afghanistan Pakistan India – gets built across Afghanistan. Right now Turkmenistan is building their section, Field of Dreams-style (if you build your section, they will build theirs). But there are no plans at this point for a start date on construction of the Afghan or Pakistani legs of this boondoggle, no less the Indian. Even most Pakistani sources omitted any reference to Iran in the announcement. That, in and of itself, makes you wonder. So, while the Trump administration continues to pursue its ‘energy dominance’ strategy to put us in the driver’s seat producing the marginal barrel of oil, Putin continues to make deals that undercut that and strengthen his central Asian partners. I’m beginning to think ‘energy dominance’ is stillborn before it even gets going. U.S. oil production is accelerating and reaching all-time highs but so what if you can’t get the oil to market or have the refinery capacity to add value before exporting it around the world. Look no further than the spread between West Texas Intermediate (WTI) and Brent Crude prices. WTI is trading now at a $10 discount to Brent. While that looks good from a ‘market share’ perspective, the reason for that is that the pipeline infrastructure in the U.S. cannot bring the oil pouring out of the Permian Basin to market. We’re in a different era while the oil market remains tight. 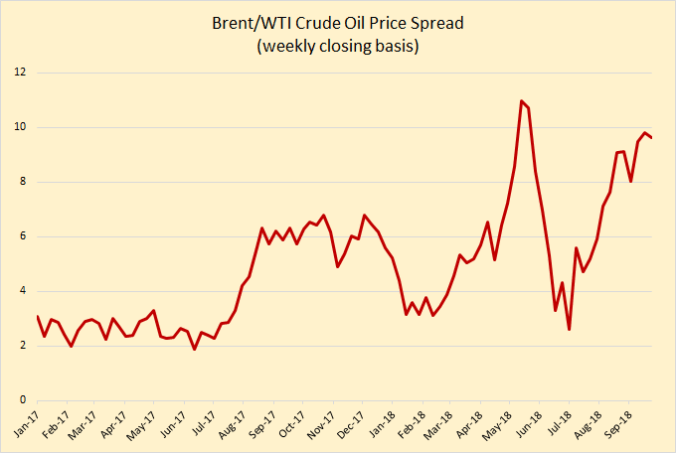 So, if the market is so tight, why is WTI trading at such a steep discount to Brent? Sure some of this is worry over Iran being cut out of the market, but that explains the total oil market being up $10-15 over where it should be. It doesn’t explain the change that began last summer. This infrastructure problem is real. The slowdown in drilling is here. Multiple Frac Sand producers are looking at layoffs or contract terminations based on the Permian Basin boom turning quickly to bust, not because there isn’t demand for the product but because there’s too much oil overwhelming the market. If the entire supply chain isn’t tightly aligned then the project to marginalize Iran in the oil market will fail when November 4th rolls around and demand is still there but the suppliers can’t meet them. That’s why BP’s CEO is going after the Saudis saying they have spare capacity they aren’t bringing on line. No one wants to take the blame for the disruptions in the crude oil market on the horizon. Which brings me back to India, Pakistan and Iran. India will talk a good game to Secretary of State Mike Pompeo about cutting back on imports, but at the end of the day India will buy as much Iranian oil as they need, so will China. There may be some virtue signaling, cutting back ten percent or so, but there is no way this market can take 2.8 million barrels of Iranian exports off the market and be in balance. And if you want to know why Modi finally made the decision to get off the fence about the BRICS look no further than the U.S. not being able to control the flow of energy like it has in the past. With each little victory across central Asia, Putin makes it easier and easier for other leaders to say yes to him and no to the U.S.
One can only hold a system out of balance for so long. And “The Heartland” of Central Asia has been in a constant state of upheaval for more than a hundred years thanks to first the British and then the U.S.’s imperial demands. But, the economic incentives are too big for countries like India to not make peace with its neighbors. Modi finally came to the conclusion that it is time to stop playing into the geopolitical games stoked via cultural and border conflicts by the U.S. That going it alone as a buffer state only holds India back in the long run now that there is a resurgent Russia ready to work with China to knit the entire region together. We are witnessing, bit by bit, the end of our ability to implement the Brzezinski Doctrine of Central Asian chaos. Putin gets this and plays the game very well. And he just took a big piece off the board. To support more work like this and get access to exclusive commentary, stock picks and analysis tailored to your needs join my more than 190 Patrons on Patreon and see if I have what it takes to help you navigate a world going slowly mad.